The "TAKEAWAY" for Managers™ California Edition Series gives managers and supervisors a basic foundation for legal compliance, in a straightforward and easy-to-remember way. 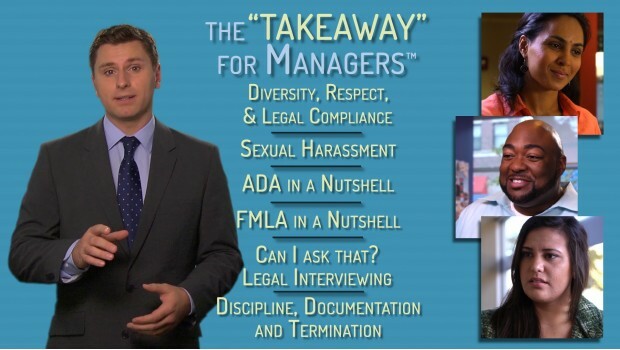 Conversational and easy to use, the series covers Sexual Harassment, Diversity, Respect & Legal Compliance, Legal Interviewing, ADA, FMLA, and Discipline, Documentation & Termination. These concise programs are both comprehensive and simple to understand, with short vignettes that illustrate and dramatize the material presented. Each of the six programs concentrates on four key learning points and their “takeaways,” or sentence-long summations to provide basic tools on managing a respectful and legally compliant workplace. Includes California legislation AB 1825 and AB 2053 training requirements for California managers and supervisors.